• The United States has led airstrikes against ISIS in Iraq and Syria. • RAF Tornado GR4 and the Reaper remotely piloted air system (RPAS) have conducted airstrikes against ISIS in Iraq. Reaper and Rivet Joint aircraft have also been authorised to fly surveillance missions over Syria. • France, the Netherlands, Belgium, Australia, Canada and Denmark have all conducted air strikes in Iraq. • Bahrain, Qatar, Saudi Arabia, Jordan and the United Arab Emirates have all supported US strikes against ISIS in Syria. • Combat troops have been explicitly ruled out by the UK and the other the countries involved, amid debate about the reliance on air power alone. However a number of British soldiers are training Peshmerga forces in northern Iraq, while further advisory personnel are expected to be deployed to Iraqi headquarters as part of a broader package of support announced on 5 November. The US also announced on 7 November the intention to deploy up to 1,500 additional military personnel in order to initiate a more comprehensive training package for Iraqi forces. Several Coalition partners have offered additional trainers as part of that initiative. UN Secretary-General Ban Ki-moon speaking in Geneva said that presently this is a critical point for Syria, and the world is watching with skepticism due to previous promises being broken by the government of Syria. He has said that Syria’s words on a ceasefire should be will be matched by their deeds, but that UN military action to get Syria would not be an option. Obviously Syria’s adherence to the ceasefire is therefore voluntary. Many including the Arab-envoy Kofi Annan are concerned that Syria may not comply with all the points in the peace plan set down by the UN. Under these terms the six- point peace plan agreed to by Syria, all violence and fighting was to stop on today. Kofi Annan, The UN and Arab League envoy to Syria, has said he has received assurances from Damascus that it will respect the ceasefire plan he has previously proposed. Mr Annan who has been visiting Iran said there could be “improved conditions on the ground” by Thursday morning. However the Syrian government had previously failed to withdraw troops and weaponry from large population centres as it had agreed. So far at least 100 people have been reported dead. Three people were killed on Wednesday after violent shelling in the city of Homs and the Deraa province. Mr Annan told reporters in Tehran that he had received “further clarifications” from the government of President Bashar al-Assad on how it intended to suspend hostilities, and respect his six-point peace plan. Heavy artillery fire has been rocking Homs, as Syrian troops step up an assault on the restive city. A BBC correspondent there describes almost constant blasts, in the fiercest attack in the 11-month uprising. US President Barack Obama said it was important to resolve the conflict without outside military intervention. Meanwhile, Russia and China defended their veto of a UN draft resolution criticising Syria – a move that angered opponents of President Bashar al-Assad. Later the US State Department said it had closed its embassy in Damascus and pulled out all remaining staff because of security concerns. Today the league of Arab States declared it’s decision to impose sanctions against Syria and of Bashar Al-Assad, President of Syria and Regional Secretary of the Ba’ath Party. There is also international concern over the fate of two Syrian Activists Mohamed Bachir Arab and Ahmed Omar Azoz. The two activists have been missing from their home town of Aleppo since 2 November, raising fears that they have been arrested and are being held in secret detention where they may be at risk of torture. Mohamed Bachir Arab and Ahmed Omar Azoz, were reportedly involved in organising peaceful protests in Aleppo. They were both in hiding from the Syrian authorities at the time they went missing, after security forces visited their homes. According to sources, Mohamed Bachir Arab was planning to meet his friend Ahmed Omar Azoz on 2 November. The men have not been seen or heard from since. “We are worried that the two activists have been arrested and are being held in secret detention, not only because of the recent interest the Syrian security forces have shown in them, but also because there has been a widespread pattern of activists being whisked off the streets and held in isolation from the outside world. “The authorities should immediately disclose any information they have about their whereabouts. 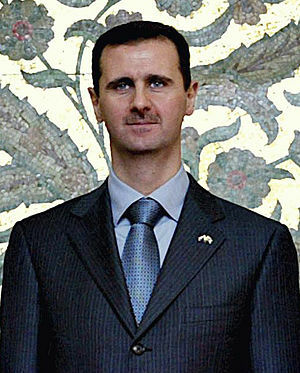 Syria – Assad May Be Next! Thousands of anti-government protesters took to the streets across Syria today after a televised appearance by President Bashar Assad, shouting for him to step down. Human rights groups say more than 2,000 people have been killed in the government’s crackdown on a five-month-old uprising. The regime has unleashed tanks and snipers in an attempt to stamp out the revolt. In a now-familiar refrain, Assad on Sunday promised imminent reforms – including parliamentary elections by February – but insisted the unrest was being driven by armed gangs and Islamic militants, not true reform seekers. He also said he was not worried about security in his country and warned against any Libya-style foreign military intervention. His remarks appeared designed to portray confidence as the regime comes under blistering international condemnation. Yesterday the United Nations Human Rights Chief blasted the President for human rights. There are different views to the protest and also suspicion as to the UNs and especially American intervention and involvement with the situation in Syria.